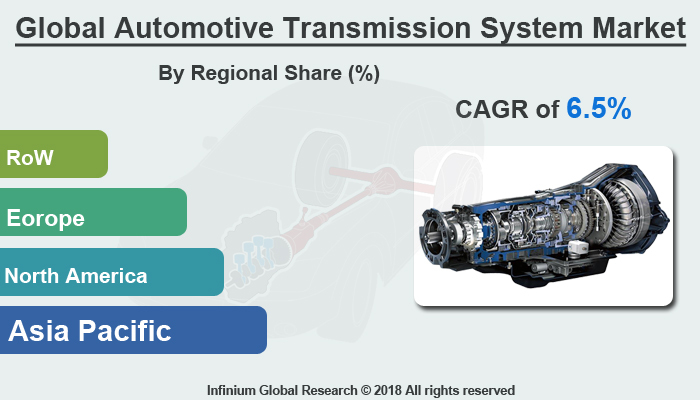 A recent report published by Infinium Global Research on automotive transmission system market provides an in-depth analysis of segments and sub-segments in the global as well as regional automotive transmission system market. The study also highlights the impact of drivers, restraints, and macro indicators on the global and regional automotive transmission system market over the short term as well as long term. The report is a comprehensive presentation of trends, forecast and dollar values of the global automotive transmission system market. According to the report, the global automotive transmission system market is projected to grow at a CAGR of 6.5% over the forecast period of 2018-2024. The function of any transmission is transferring engine power to the driveshaft and rear wheels. Gears inside the transmission change the vehicle's drive-wheel speed and torque in relation to engine speed and torque. Moreover, the transmission system provides means of connection and disconnection of the engine with rest of powertrain without shock. Manual transmission or automatic transmission is used in the automotive transmission system market. The advantage of using automatic transmission is that the car decides when to shift and automatically changes gears for the driver whereas in manual transmission the driver is responsible for changing the gears of the car. Efficient transmission system allows the vehicle to attain high cruise speed while providing the necessary safety. The transmission system is composed of the clutch, the gearbox, propeller shaft, universal joints, rear axle, and wheels. Consumer preference for improved driving experience and smooth gear shifting drives the growth of the automotive transmission system market. Moreover, the growing demand for automatic and semi-automatic transmission systems used in the vehicles to escalate the revenues of the OEM manufacturers. Strong demand from the passenger and commercial vehicles is augmenting the automotive transmission system market. Moreover, increasing per capita income among individuals in emerging countries such as India, China, and Mexico has led to an increase buying of automotive transmission system markets. However, economic slowdown and political instability in particular regions may affect the growth rate of the automotive transmission system market. With the increase inclination towards the adoption of the automatic transmission system coupled with rising disposable income, the market of automotive transmission is expected to increase, in terms of value. Geographically, the Asia Pacific region held the highest market share in the automotive transmission system market. Increased vehicle production and increased adoption of the automatic and semi-automatic transmission system in the vehicle is primarily driving the demand for the automotive transmission system market. Countries like India and China has the highest number of passenger car sales in this region. With rising disposable income and increase per capita spending the demand for the automotive transmission system market is expected to rise. Regions such as the Middle East & Africa and South America is expected to grow at a significant rate during the forecast period, owing to recovery in their respective economies. The report on global automotive transmission system market covers segments such as transmission type and vehicle type. On the basis of transmission type, the global automotive transmission system market is categorized into hydraulic transmission system and mechanical transmission system. On the basis of vehicle type, the global automotive transmission system market is categorized into passenger vehicles and commercial vehicles. The report provides regional analysis covering geographies such as North America, Europe, Asia-Pacific, and Rest of the World. In this section, the key trends and market size for each geography are provided over the period of 2016-2024. The countries covered in the North America region include the U.S., Canada, and Mexico; while the Asia-Pacific region includes countries such as China, Japan, India, South Korea, Malaysia, and among others. Moreover, Germany, U.K., France, Spain, and Rest of Europe are the major markets included in the European region. The U.S. drives the growth in the North America region, as it is the largest market in the region. In the Asia-pacific region, rapid industrial growth in India and China offer a substantial potential for the growth in the automotive transmission system market. As a result, the APAC region is projected to experience a growth at a CAGR of x.x% over the forecast period 2018-2024. The report provides profiles of the companies in the global automotive transmission system market such as Eaton Corporation, Hyundai Dymos, ZF Friedrichshafen AG, Continental AG, Schaeffler AG, Magneti Marelli S.p.A, JATCO, Aisin Seiki, and Allison Transmission. The report provides deep insights into the demand forecasts, market trends, and micro and macro indicators. In addition, this report provides insights into the factors that are driving and restraining the global automotive transmission system market. Moreover, The IGR-Growth Matrix analysis given in the report brings an insight into the investment areas that existing or new market players can consider. The report provides insights into the market using analytical tools such as Porter's five forces analysis and DRO analysis of automotive transmission system market. Moreover, the study highlights current market trends and provides forecast from 2018-2024. We also have highlighted future trends in the automotive transmission system market that will affect the demand during the forecast period. Moreover, the competitive analysis given in each regional market brings an insight into the market share of the leading players. This report will help manufacturers, suppliers, and distributors of the automotive transmission system market to understand the present and future trends in this market and formulate their strategies accordingly.